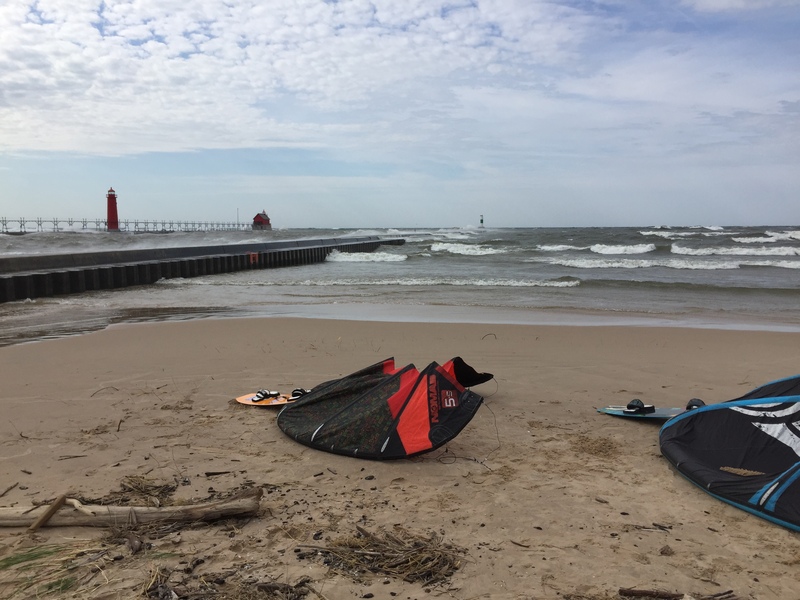 Last Monday gale force winds summoned Great Lakes surfers and kiteboarders to battle the fierce waves of October. Big days on Lake Michigan are impressive and Monday was no different. The wind was out of the southwest in the 30 knot range when we arrived at North Shore in Grand Haven. Wind whipped over the water creating a constant fog like spray as waist to shoulder high rolling waves curled around the pier heads. Back at the parking lot surfers and kiteboarders were gearing up to get on the water. I could feel the energy in the air as I rushed to get my wetsuit on. Blue sky was breaking through the clouds and for a minute I thought about how lucky I was to live on the lakeshore and have the ability to take advantage of days like this. Earlier in the week Jetty had convinced me(didn’t take much convincing!) to take the afternoon off from work to do a downwinder from North Shore to Pere Marquette. I’d never taken time off from work to go kiteboarding before but the forecast looked too good to miss. With the high water levels this year there is just barely enough beach to rig and launch your kite at North Shore. Debris from erosion is a secondary problem and you have to be careful not to damage your lines on the dead dune grass laying in piles along the shoreline. I launched first on Jetty’s 8M. I took a few tacks and felt great. The wind was steady and the waves were spaced out enough to find openings to get offshore fairly quickly. Jetty launched and we rode North Shore for a while before I saw Jetty signal to get going. The signal we agreed on to start the downwinder was to wail on the air guitar. I signaled back and we went north. The great thing about a downwinder is that you are free to play around in the waves as much as you like since there’s no need to tack upwind when you are done. It’s also a nice way to enjoy the scenery along the shoreline. The red, orange, and yellow colors of fall lined the dunes as we made our way to Muskegon. The only downside to a downwinder is that once you are at the mercy of mother nature to make it to your destination. We rounded Lake Harbor park and the wind started to drop to the low 20 knot range. I was under powered but doing okay on an 8m kite. Jetty was struggling on his 5.5m kite so he left me in his wake as he made a b-line for Pere Marquette. As the red lighthouse of the north pier came in to view so did other various water hazards. There are a series of small metal break walls between Pere Marquette beach and Lake Harbor Park. The waves were bigger near Muskegon and it was tricky to get past the break walls with the light wind and surf but I made it through without incident. An hour and a half and 12 miles later I arrived at Pere Marquette dehydrated and tired but also recharged to take on the rest of the week. That was a great day! We did the same trip about a half hour before you guys and enjoyed seeing you guys finish up, knowing that we weren’t the only ones to get to enjoy the big surf! Oh yeah. You guys were just taking off when we got to the north pier. We tried to see if we could catch up for a while but I think you guys were too far ahead. It was good to know you guys were up there blazing the trail! Just some thoughts watching your video (please don’t be offended, and I’m envious of the downwinder). I thought you were getting into a directional, which would be even more fun for this purpose. When you jump, trying sending the kite forward as you descend, and point your board downwind for a smooth landing. Finally, how come you were dehydrated? Don’t you drink the water? Thanks for the comments and no worries I’ll take tips anytime. I thought the same thing watching the video(board not pointed downwind, didn’t send the kite forward, crash!). I think my problem is I don’t ride a smaller kite very often and am a bit jittery when boosting. I only jumped a few times in the beginning of the downwinder so I don’t think I got dialed in. I definitely want to get on a directional for days like that but haven’t made time to learn. I had a kid last November and haven’t gotten out riding as much this year. For the water… I don’t intentionally drink it but do take a few face fulls now and then when crashing 🙂 I’ve never gotten sick but don’t want to chance it. I was also sweating a lot that day. I wore a neoprene hoodie sweatshirt on top of my wetsuit and it was warmer than I thought. Hugh, Where do you ride? Just curious and thanks again for the feedback. There’s a small group of us that ride on Clinton Lake in east central Illinois. 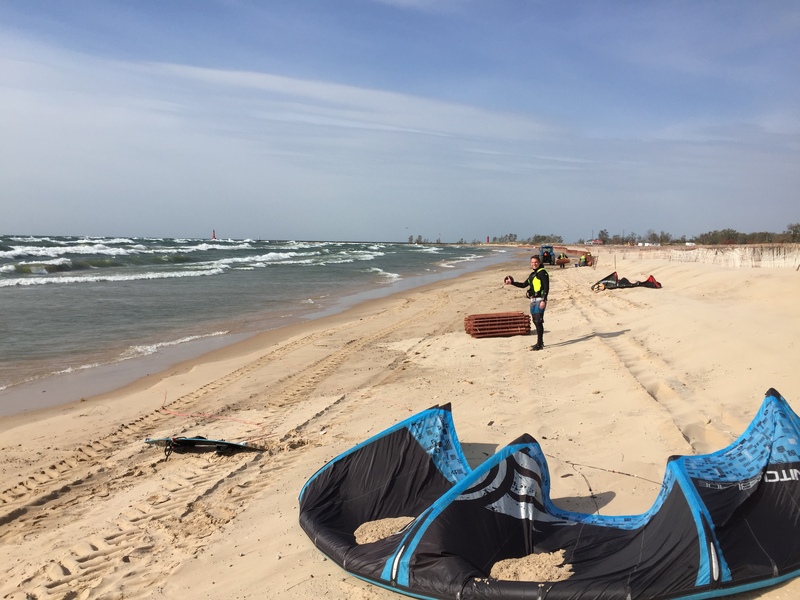 Occasionally we get up to Lake Michigan, like for the KOTL last year, but I’ve been skunked so many times I don’t really trust it anymore (grand total of three good kitesurfing visits in 10 years! ), and the Chicago Kitesurfers forum that used to be so informative about where to ride is not very helpful anymore (hence my paying attention to your forecasts, which unfortunately I’ve yet to take advantage of – I’d love to meet up for a downwinder one day – I did one with the Chicago gang led by West a few years ago, but bailed before the end – I think it was South Haven to St. Joe). I learned ten years ago at the age of 50, so now am turning 60, and only barely seeing improvements these days (although attempting chophops on a strapless board now). Anyway, a group of us from Illinois and Indiana go out to Cape Hatteras each Spring and Fall for a week, and our local group take our families out for a week in the summer, so that’s where I learned and I love it there. Oceanside downwinders are great, including across the Ocracoke Inlet. I’m from South Africa and still have family in Cape Town, so each winter I go there for 1-2 months of their summer and the strong SEaster is amazing. That’s where I really learned to jump, and I am a one-trick pony in that regard, just doing regular high jumps, but it is an essential skill for the epic days there when the waves are double overhead and come in sets that extend for miles, so you have to be able to jump over them to get out. My brother lives in Honolulu, and when I visited there a few years ago I went kiting at Mokuleia on the NW shore, where the local hotshots ride strapless (TopHat, Felix, Adriana, etc) and is the homebase for the Switch kites guys (Felix is their tester – watch some videos on YouTube). They encouraged me to try strapless on my brother’s surfboard, and I loved it, so that’s what I do even on our local lake, just to get better at it for when I get into waves.